Imperfection is defined as the quality or state of being imperfect; it is something flawed, defective, or incomplete (The New Penguin English Dictionary). Western culture has always seemed interested in perfection, in the regularity and clean lines that the development of science and technology has made possible. We could say that technological development has led, and has been driven by, a trend to perfection. The predominance of automation processes and quality controls have led to the almost total elimination of errors and imperfections. Thus, what we have witnessed is the dominance of an aesthetic model tied to perfection in every sphere of human life: the body, the style of life, artifacts, and their materials. Everything has to look beautiful in the sense of being flawless, while appearances have become more important than essence and substance. The rising interest in imperfection in the context of industrial design is explained as a response to the all-dominating perfectionist technology of our time (Ramakers, 2002). The Imperfection Enhancement framework, in Master’s Graduation project by Francesca Ostuzzi. Research assistant: Valentina Rognoli. Politecnico di Milano, Faculty of Design, 2009. The need to reintroduce anomalies, defects, and imperfections – all elements that can evoke the human presence – may, therefore, be due to the reaction against the aesthetics of mass production: always the same and almost always perfect. The topic of imperfection is more crucial today than ever because it is connected to sustainability and responsible consumption. Our aesthetic perception is challenged, because we must learn to accept uneven surfaces, repaired objects, and non-homogeneous materials as enablers of new experiences. The signs of the relationship between user and artifact are actual traces that communicate, testify and make this relationship indelible. The way materials make us think, feel, and act (i.e. materials experience) through their unique temporal qualities (e.g. how they dissolve over time) may offer novel opportunities for the design of products which show the passing of time as rewarding. This topic has been explored in projects like A Matter of Time and Chronomaterials. A Matter of Time. 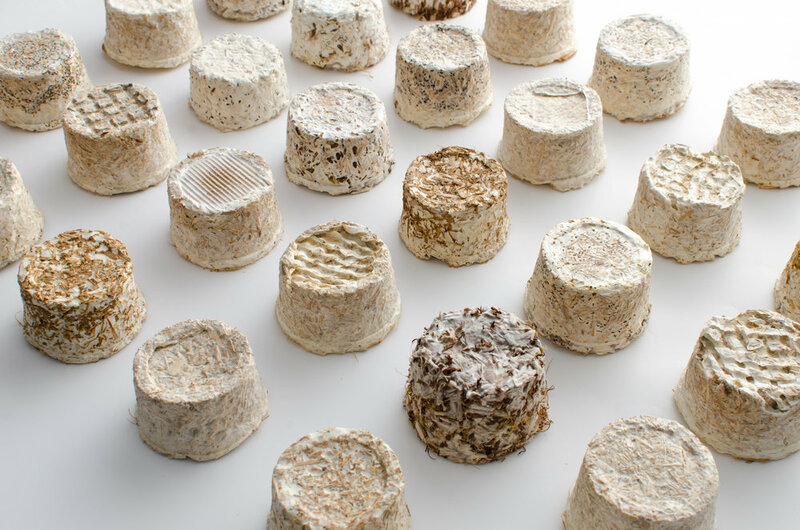 Mycelium experimentations enhancing imperfection, in Master’s Graduation project by Stefano Parisi. Tutor: Valentina Rognoli. Politecnico di Milano, School of Design, 2015. How will our relationship with imperfect objects and materials change? Will we be ready to accept aging and consuming surfaces and to consider as appealing artifacts made of already used material? your own machinery!” by Valentina Rognoli and Ernesto Oroza. Ostuzzi, F. (2009). Gli oggetti (in) della crisi. (The objects (in) of crisis). Unpublished graduation thesis, Politecnico di Milano, Faculty of Design (III), Master of Science in Design and Engineering. Tutor: Marinella Levi. Co-Tutor: Francesco Trabucco. Parisi, S. (2015). A Matter of Time. Tempo, Processo, Materia. (A Matter of Time. Time, Process, Matter). Unpublished graduation thesis, Politecnico di Milano, School of Design, Master of Science in Product Design for Innovation. Tutor: Valentina Rognoli. Ostuzzi F., Salvia G., Rognoli V., Levi M. (2011). Il valore dell’imperfezione: l’approccio wabi-sabi al design, (The value of imperfection: the wabi-sabi approach to design). Milano: Franco Angeli, pp.1-135, ISBN: 978-88-568-3886-2. Karana E., Giaccardi E., Rognoli V. (2017). Materially Yours. In: Chapman, J. (Ed), The Routledge Handbook of Sustainable Product Design. Routledge, London, UK, 2017. Rognoli V., Karana, E. (2014). Towards a New Materials Aesthetic Based on Imperfection and Graceful Ageing. In: E. Karana, O. Pedgley, O., & V. Rognoli (Eds.) Materials Experience: Fundamentals of Materials and Design (pp. 145-154). Butterworth-Heinemann: Elsevier, UK. Parisi S., Rognoli V. (2016). Superfici imperfette (translation: Imperfect Surfaces). In: Material Design Journal n.1, Università di Ferrara, pp.78-92. Parisi S., Rognoli V., Ayala C. (2016). Designing Materials Experiences through passing of time. Material Driven Design Method applied to mycelium-based composites. In: Proceedings of 10th International Conference on Design & Emotion, September 2016, Amsterdam, The Netherlands, pp.239-255. Nobels E., Ostuzzi F., Levi M., Rognoli V., Detand J. (2015). Materials, Time and Emotion: how materials change in time? In: Proceedings of EKSIG 2015, Tangible Means: experiential knowledge through materials. November 2015, Design School Kolding and University of Southern Denmark, DK. Ostuzzi F., Salvia G., Rognoli V., Levi M. (2011). The value of imperfection in industrial product. In: Proceedings of DPPI'11, Designing Pleasurable Products and Interfaces, June 2011, Politecnico di Milano, Politecnico di Milano, Italy. Ostuzzi F., Salvia G., Rognoli V., Levi M. (2011). Reassess Injection Moulding Defects for Sustainability. In: Proceedings of SIM 2011 - Sustainable Intelligent Manufacturing, June 2011, Leira, PT. Salvia G., Ostuzzi F., Rognoli V., Levi M. (2010). The value of imperfection in sustainable design. The emotional tie with perfectible artifacts for longer lifespan. In: Proceeding of LeNS Conference. October 2010, Bangalore, India, pp.1579-1589. Rognoli, V., Oroza, E. (2015). Worker, build your own machinery!” A workshop to practice the Technological Disobedience. In Proceedings of PLATE Conference 2015, At Nottingham Trent University.